At the end of September, my new husband and I adventured to Hot Springs, South Dakota for our honeymoon. Hot Springs was a beautiful little town that smelled like juniper and mint, but the real treasure in Hot Springs is The Mammoth Site. My husband, the paleontologist enthusiast, and I, also intrigued by paleontology, were excited to go to the biggest known concentration of mammoth remains in the world. We wanted to know why they were there, how they got there, and most importantly, we just wanted to see it! So, my husband and I packed up a camera, a sketchbook, and began our adventure. When we first arrived at the museum, we walked past a visual geological timeline, an epilog of sorts. The timeline was created with signs full of illustrations showing the environment and some inhabitants from each era. Each sign had some sample rocks (boulders) that were prevalent during that period. 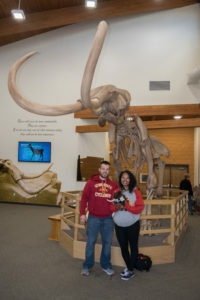 New Mr. and Mrs. Worrell at the entrance of the Mammoth Site Museum. Upon entrance, we were greeted by a giant replica of a mammoth and very friendly staff. After a few selfies and purchasing of tickets, we made our way into the theater to watch a short, informative video about the formation and creation of the dig site. The content was astonishing, but I was interested in the animations and video content. They were not only well done but were also attention-grabbing. The intro was so cool! After, we began the tour. Through some double doors, we were greeted by a giant mural reimagining the site when it was still a flowing waterhole. Bright, lush, and alive! Around the corner was the site. The sedimented pit is 100 x 150 feet, and they have dug in 20 ft on one side and 15 ft on the other side. However, according to Dr. Jim Mead from the museum, cores have proven there is still 40+ feet of sediment and bone! As we made our way around the perimeter of the site, going up and down different viewpoints, our tour guide shared with us information about the site. 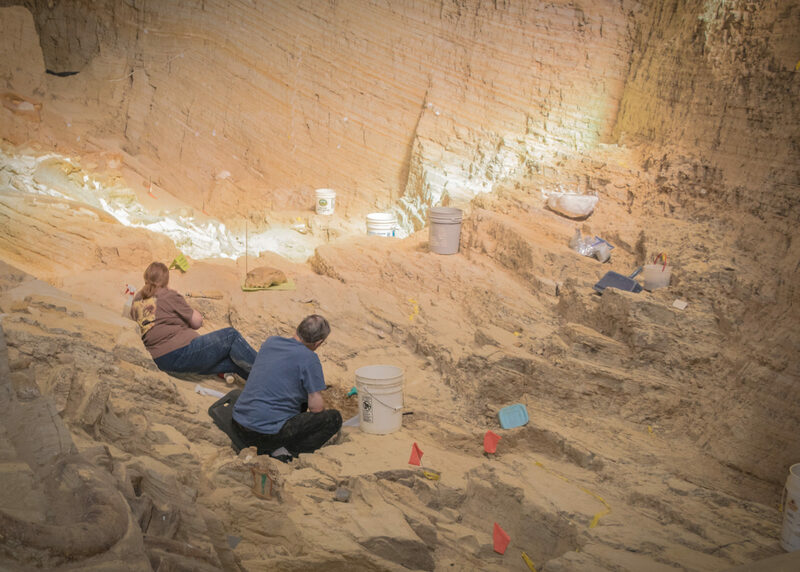 He covered everything from the composition of the soil to the different species that have been found in the pit. I found the content interesting in itself, but the guide was funny and made the tour even more enjoyable! Great for children if you have any. A great supplement to the guide was the illustrations and wall paintings that covered the walls. There were illustration posters covering everything from teeth composition to anatomy comparison. We spent a lot of time looking at these and trying to commit as much as we could to memory. Ben was focused on content, I was focused on layout. My favorite one was the comparison of human versus mammoth teeth. A lot of the work is done by volunteers, but they do have two artists on staff. After we had our formal tour, we were encouraged to keep wandering around and keep taking pictures. There were a few volunteers digging in the site, so we asked them about their process. The volunteers were very friendly and welcomed our questions! They were armed with water bottles and dental tools, gently moving dirt around, uncovering more specimens. 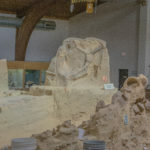 We learned that to officially help excavate, one has to be part of the Excavation and Preservation Program at the museum or part of a planned Roads Scholar visit. Both of these are a pay-to-excavate program. Of course, there are other options via contacting The Mammoth Site. After talking to volunteers, we made our way down to the prep room. We watched skilled workers carefully remove casts from transferred specimens and clean them up. Working in the prep lab is very similar to applying to help dig! We then traveled into the exhibit room where there was more anthropology focused content. Arrow points, dwellings, chipped bone, and pots. There were also maps showing where different mammoths roamed the world and displays showing replicas of mummified mammoths found throughout the world. Of course, we stopped at the museum gift shop! There was a dig cave that would be awesome for curious kids and plushies for little future paleontologist (we bought a plushie mammoth for our nephew). There were also site books, field books, and storybooks for all ages. Throughout this post, I have mentioned Dr. Jim Mead. Dr. Mead is the on-site paleontologist and is a walking encyclopedia of answers regarding the topic. He was influenced into science at a very young age with biologist parents. Upon going to college, he discovered the joy of the study of animal remains from archaeological and paleontological periods. He later went on to achieve his Ph D. He has since been doing research in the Pleistocene field for the past 40 years! Dr. Mead shared with me that he has been with the Mammoth Site on and off throughout its discovery in July of 1974. 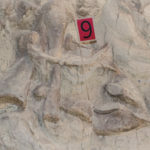 However, after the passing of the late Dr. Larry Agenbroad, Dr. Mead was willing to take the position of Director and Chief Scientist for the Mammoth Site. 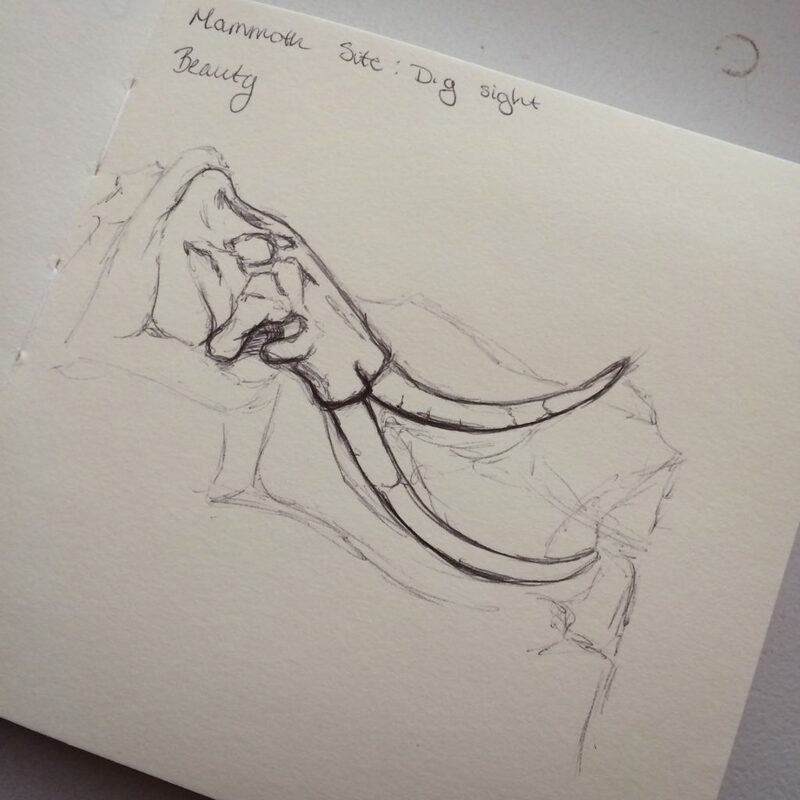 The Mammoth Dig Site was a top ten adventure for me and the perfect honeymoon spot! I was mind-blown with entertainment and education! I walked away with so many ideas and new concepts, my husband walked away simply in aww, and I also got the opportunity to draw a bit, always a bonus. We live in Iowa, how did we not know this place existed!?! My husband and I are hoping to go back again in the future and maybe even get the opportunity to be dig volunteers. A big thank you to both Bethany Cook for helping me get connected to Dr. Jim Mead and thank you to Dr. Mead for taking the time to answer my many questions. ← Who Cares About Case Studies? your information is not good, but what if you added a post title that makes people want more? post titles to get people to open the links. You might add a video or a picture or two to get people excited about what you’ve got to say. I don’t realize who you’re however definitely you are going to a well-known blogger in the event you are not already. I care for such info much. I used to be seeking this particular info for a very long time. Thank you. I have contact information at the bottom of the page. I surprise how so much effort you set to make one of these great informative website. to…HaHa). You definitely put a fresh spin on a topic which has been discussed for decades. Hi there to every , as I am genuinely eager of reading this webpage’s post to be updated regularly. it very bothersome to inform the truth however I’ll definitely come again again. Hi to every , as I am truly keen of reading this web site’s post to be updated daily. I use Yoast and I am quite happy with it. Best of luck! I did everything on my own, but WordPress had some fantastic templates that helped get everything started. It’s not too hard setting up a blog. This is actually my third, but it’s the first business blog. There are blog sites like medium.com or blogger.com that create a platform for you. You can also get a personal website and start blogging that way as well. I ended up going with godaddy.com but there are many other website platforms out there. Marvelous, what a web site it is! This weblog presents useful information to us, keep it up. What’s up to every one, the contents existing at this web site are in fact amazing for people knowledge, well, keep up the nice work fellows. That sounds fine to me! Happy blogging! A number of them are rife with spelling issues and I find it very bothersome to tell the reality on the other hand I’ll definitely come back again. Hi there, after reading this remarkable paragraph i am also cheerful to share my knowledge here with friends. do so! Your writing taste has been amazed me. Thank you, quite nice article.